Set up syndication to automatically publish your latest blog posts to facebook and twitter. Set up brand searches in the Inbox page to keep tabs on mentions of your brand. Install the Facebook blog tab to show your latest posts in a tab on your facebook page. You’re ready to rock and roll and start harmonizing your social media empire! Brand search is a powerful feature to find out what people say about you on social networks. Symphony scours Twitter and Facebook to find mentions of your brand (and any common variations and misspellings) and present them in a simple list in one place. From there you can reply or comment on those mentions directly from one place. First go to the Inbox page (see the image below). If you don’t see an “Inbox” menu then maybe your subscription plan doesn’t provide it. In which case, consider upgrading your plan. The inbox is meant to aggregate mentions of your brand so you can easily respond to them at once. Thus, we recommend you put only your brand keywords, not general industry keywords. Using anything other than your brand name will most likely clutter your inbox, making it difficult to see the posts you really need to respond to. One feature that makes searches powerful in Symphony is the ability to reply to and Cross-Post search results to your own networks. If you hover over a given post you’ll see several options pop up: Crosspost, Reply, Retweet, and Favorite for Twitter, and Like, Comment, and Share Facebook. The “Task” button will assign this post to a teammate to respond to (available in select plans). Crosspost allows you to share that post to any social profile, even if it’s on a different social network. 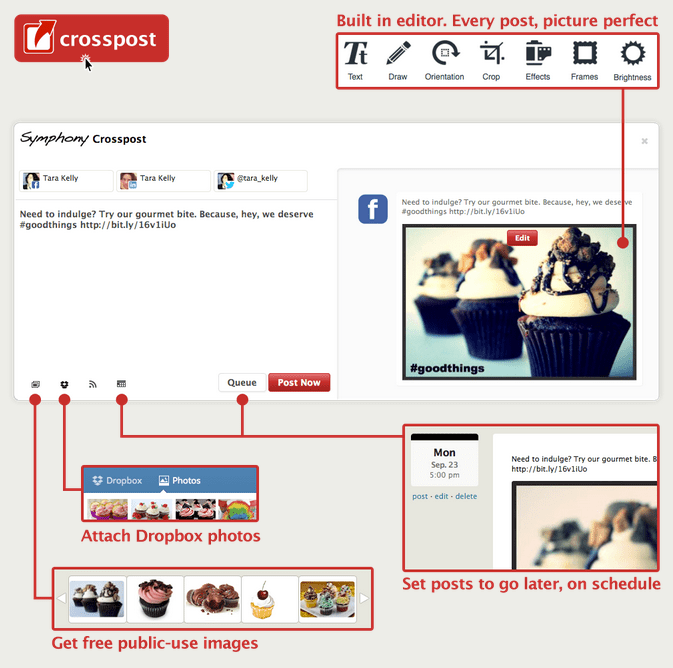 Crosspost is a nifty tool to quickly share content across several social profiles. Crossposting is straightforward: click the Crosspost button, select your targets, write something, click Post. That’s the basic flow. But there are a lot of interesting little gems that can save you a lot of time. Read on! Let’s start with an example. Here I’ll share a link to our Facebook page and Twitter accounts. 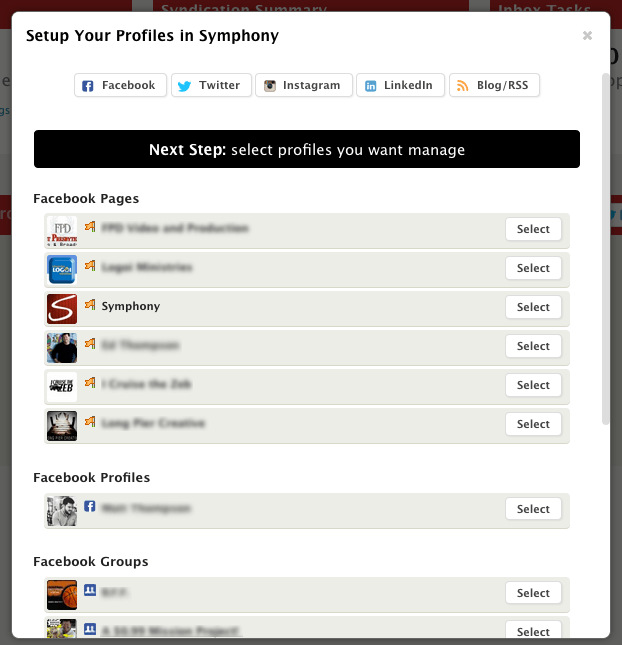 As you see, I’m selecting the two targets from the list of profiles that I’ve connected to Symphony already. Then I just copy&paste the link into the big text area on the left side. Immediately, Crosspost reads the link and adds the title, summary, and image. The area on the right side shows a preview of how the post will look like on each of the social networks I’m about to post it to. 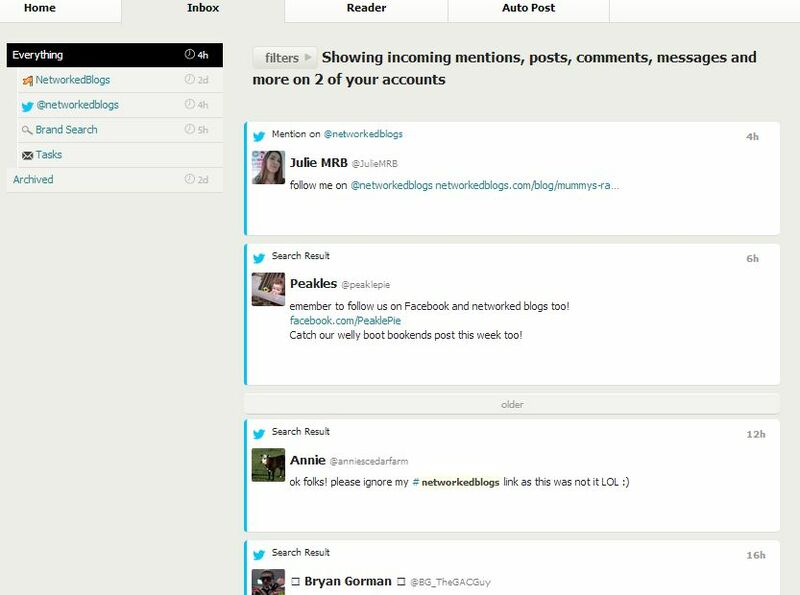 You can select many targets to publish the post to several places at once. However, you must’ve already connected those targets to Symphony from the home page. Notice how I paste the link only in the text area and Symphony automatically populates the rest (title, image, and summary). You can edit the details afterwards. The preview on the right side is essential. It let’s you see how your post will look like before you post it, so you can make any necessary edits if needed. Once you click Post, the post will be immediately published to the targets you selected. What Else Can I do in Crosspost? Share your latest blog posts. Crosspost someone else message from the Inbox. For example, if someone write something nice about you and you’d like to share it. 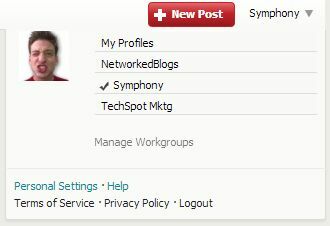 Symphony was built with power publishers and social media professionals in mind. If you’re like us even just a tiny bit, you probably have multiple groups of profiles you’d like to manage. 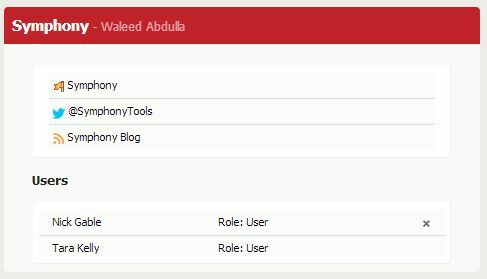 Symphony allows you to compile your profiles into separate Workgroups. You then have the ability to quickly toggle between groups to see a single set of profiles at once. First, link all your desired social profiles and blogs on the home page. These go into your ‘My Profiles’ group by default. Go to the Group Management page by clicking ‘Organize Into Groups’ on the home dashboard, or by using the drop-down menu in the upper-righthand corner of the screen. To create a new group, click the ‘New Workgroup’ button at the top of the page. Add any desired social profiles and click done. You can edit the group name by clicking the pencil in the group header. Symphony allows you to collaborate with team members. You can assign team members to be either an Admin or a User in a group. Admins have the ability to change settings for any of the social profiles in that group, while users can read, respond to conversations, and schedule posts. Each collaborator will see only the profiles in the group they’ve been added to, and every team member in the same workgroup will see the same pages when they view that group. For more on how to get the most out of Symphony for your team, see our guides on using the inbox and assigning tasks.